"Also, is a mortgage broker the same as a loan officer?" "Is one better than the other?" Although yes, finding yourself a good Realtor is vital to ensuring a smooth home purchase, a great mortgage professional is equally important to ensuring a successful closing. During the home purchase process, you will spend way more time with your Realtor, driving around, looking at homes and a good personality fit helps. For your lender, however, you might see them once or twice, or maybe even never, through the whole purchase. However, they will be busy in the background doing their due diligence to ensure your financing is being taken care of. For this article, I teamed up with mortgage expert Luke Skar of Inlanta Mortgage and MadisonMortgageGuys.com to help explain the difference between the two main sources for mortgages. 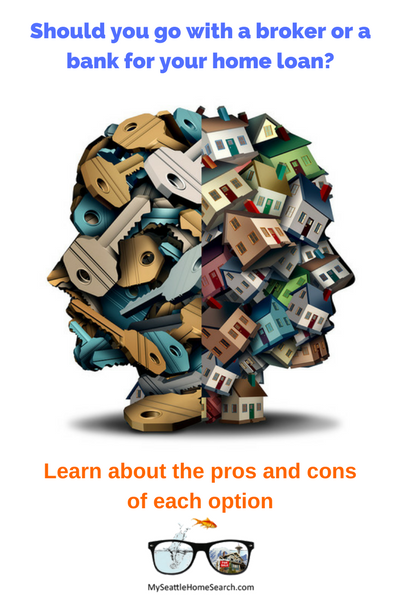 We will look at the differences between mortgage brokers and banks, the pros and cons of each and just as importantly, how to find a good lender. 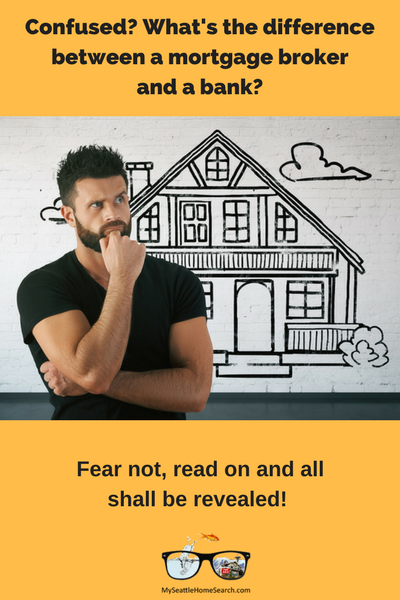 I’ll cover things from the Realtor/home buyer perspective, while Luke will go over the different types of lenders and the pros and cons of each option. Both of us will give you our opinions on how to find a good lender. When I purchased my own home back before I became a Realtor, my agent was OK but my mortgage broker was TERRIBLE and spoiled the who process for me. My stress level was through the roof, I had to chase him for answers, my phone calls went unanswered, he made errors on the paperwork and my closing was delayed. He was recommended by my agent. You’re probably wondering why I didn’t just fire him? Well, when you get to a certain stage of the home purchase process, it’s almost impossible to change your broker because the time allocated for doing so within the contract has elapsed. All the more reason to ensure you have a good lender before you start looking for homes. You can't change horses mid-stream! Subsequently, when I became a Realtor, I promised myself that one of the first things I would do would be to find some great mortgage professionals who I could refer to my buyers. That list of mortgage brokers and lenders has changed over time. My current list is made up of professionals who I’ve met through buyers who already had their own lenders that blew my socks off with their great, customer-centric service. You’ve probably seen that Super Bowl commercial with a young buyer couple standing outside a home, they immediately fall in love with it (without actually going inside), pull out their smartphones, open an app, enter a few snippets of information, and voila… they are instantly pre-approved for the home. What a wonderful world we live in. So now your choices are (1) a mortgage broker (2) a bank or (3) an app! Call me biased, but I’m not quite ready to endorse option #3 just yet. Plus, sellers might not be overly enthusiastic about accepting an "app-approved" pre-approval, especially when there are other competing offers to choose from in a multi-offer situation that might have more recognizable lenders. Convenience is nice but your mortgage is CRITICAL. To newbie buyers, the whole buying process can be a little overwhelming and the mortgage process, completely bewildering. That’s why it is vital that whoever you go with for your financing that they have your best interests, (not just best interest rates), at heart. You want someone who will explain the various financing options, the pros and cons of each one, be open about the costs of getting a particular mortgage as well as will guiding you through the mortgage process from getting you pre-approved all the way through to closing. Let’s see an app on your phone do that! With a good Realtor and good lender on your team, you will be well ahead of the curve and be a savvy/prepared buyer. By the way, it is completely the buyer’s choice as to which lender they decide to go with. You do not have to go with anyone that your Realtor recommends. Likewise, when buying a new construction home in a development, you do not have to use the builder’s preferred lender, even if they insist that you get pre-approved by that lender. It’s your money. Actually, it’s the lender's money but also it’s your hard earned down payment and closing costs. Shop around! Whether you decide to go with the monster national bank, your little local credit union or Mary’s Mortgage Emporium, that is your choice but choose wisely. If a buyer asks me (a Realtor) how much they can afford, I’m not the right person to be asking. I can tell you what you how much home you can get for X-amount of dollars, but I can’t tell you how much you can afford to borrow / how big a mortgage you can qualify for. That’s the mortgage guy’s forte. 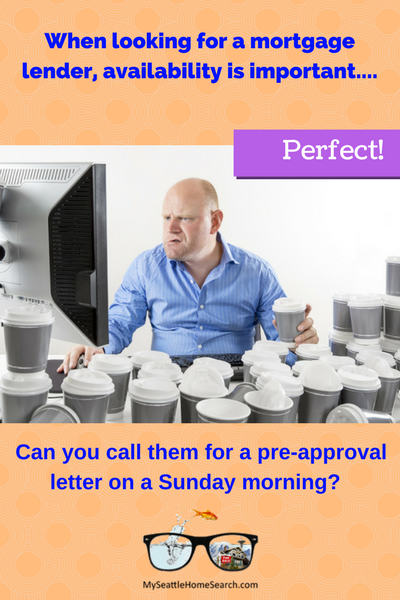 Talk to them and get pre-approved. And remember, no seller is going to accept an offer on a home from a buyer who is not already pre-approved for a loan. Getting financing for a home purchase or refinance can come from a variety of sources. The two most popular ways to get a loan is to go through a bank or a mortgage broker. Each lending institution has its own advantages and disadvantages. Normally, one is not always better than the other. In the simplest terms, a bank has its own lending criteria and offers loans by using its own funds. In contrast, a mortgage broker is a middleman. The broker works with multiple wholesale lenders in an effort to get the best mortgage for their clients. As stated earlier, there are advantages and disadvantages to both a bank and a mortgage broker. Let's start with the bank. Concerning the yield or spread on the mortgage; this refers to a fee paid to the loan officer. When banks use their funds on a mortgage, they are not required to disclose this fee. Which means the loan officer could be making $300 on the loan or $3,000, but you won’t know. The conservative lending policies are a perfect fit for people that have excellent credit scores. However, borrowers with lower scores or unusual circumstances may not be able to qualify for the bank’s loan. Multiple types of loans including most government products like the FHA, VA loan or USDA mortgage and home renovation products such as the FHA 203k or Fannie Mae HomeStyle loan. Each borrower’s situation is different and it is impossible to offer a blanket statement as to whether a bank or broker is a better choice. Not only are they different in the way they handle loans, but each institution is different with their basic operating rules. Which leads to the next point. It is easy to say that people with really high credit scores should go to a bank and everyone else should use a mortgage broker. However, that really does not cover the whole loan scenario. To help you make an informed decision, we have prepared a list of questions for you to use when talking to banks and mortgage brokers. The information you gather from these questions should help you make a decision for your mortgage needs. What is the typical turnaround time for mortgages? What fees are the responsibility of the borrower to pay at the time of closing? Can the fees be included or added to the mortgage? Can any of the fees be removed or reduced? How much money will I need to pay down on the home? What is your preferred method of communication – text, phone, in person, email? How many loans, like the one you are offering me, have you personally closed? Here are some general guidelines for each question to help you make the best decision. Question 1: If you have found a home and the seller needs to get out of the home within 4 weeks, you don’t want a lender that states they usually take 2 months to close a loan. Questions 2 and 3: In regards to the fees, some of the items are out of the hands of the mortgage lender. However, it never hurts to ask if the fees can be negotiated down. Question 4: The down payment will depend on the type of loan for which you are pre-approved. If your lender does not offer the mortgage program that you need for your situation, you will need to talk to a different lender. Question 5: This is more a matter of personal preference. However, good, communication is critical for keeping the buyer informed as to what is the current status of the loan and what's happening next. Question 6: It is really important that you are dealing with someone experienced in your type of loan. There are lots of mortgage options available. Although most brokers offer nearly every type of mortgage, this does not mean they have experience with that particular kind of loan. An experienced loan officer can help guide you through the process and make sure mistakes are not made that can cost you the home. In summary, the financing aspect of buying a home is critical and you should spend time researching and finding a good lender well in advance of starting to look at homes. Many thanks again to Luke Skar for his great advice and input for this post. 5 Tips For Finding and Choosing a Mortgage Broker or Lender from Kyle Hiscock. Ways to Get Your Mortgage Preapproval Revoked from Bill Gassett.